Roxanne Nelson is teaching Pictorial Quilting again this summer at our store and today is the 3rd class where the students are messing with fabric and constructing their pictures. We had visitors from the previous years’ classes drop by with their works to help inspire them, and I took a picture of Kyli’s Journey to show you. Journey is an aid dog that Kyli trained. You can see his name quilted into the piece. Others who played a significant role in his life also have their names quilted into this wall hanging. 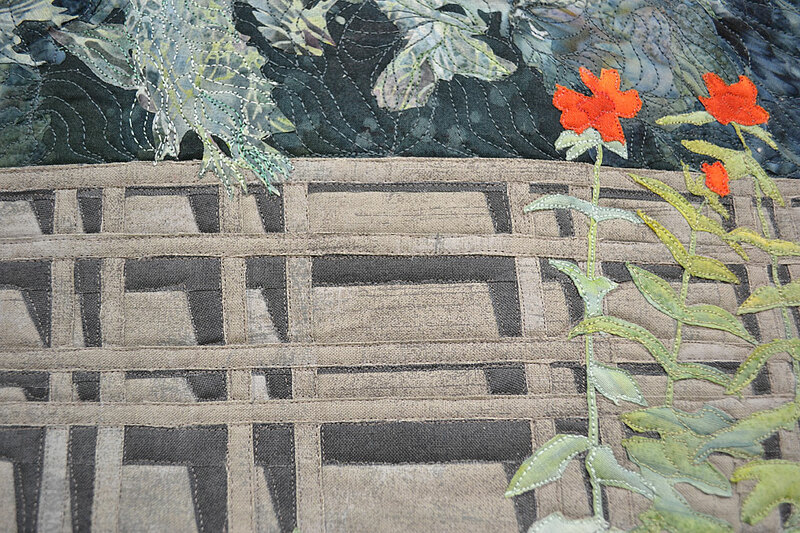 The shadows in the fence are achieved with different fabrics. If you click on the pictures you can see an enlargement and will be able to see the details. 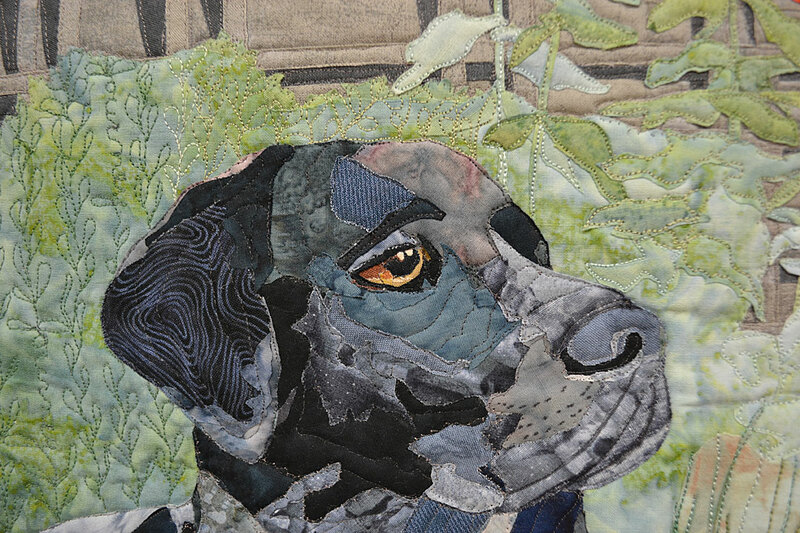 Journey – an appropriate name for the dog, the process, and the quilt. Summer finally arrived and with it the winter fabrics. Oh the craziness of this business. It was either ’cause the heat was getting to her or the Stampede was on, but this panel grabbed Barb’s attention. So she horsed around and made up a sample. Barb layered it right sides together with a matching green fabric (.65 m) and batting, sewed around the edges, leaving an opening, and clipped the corners. She then turned it inside-out pillow-case style. 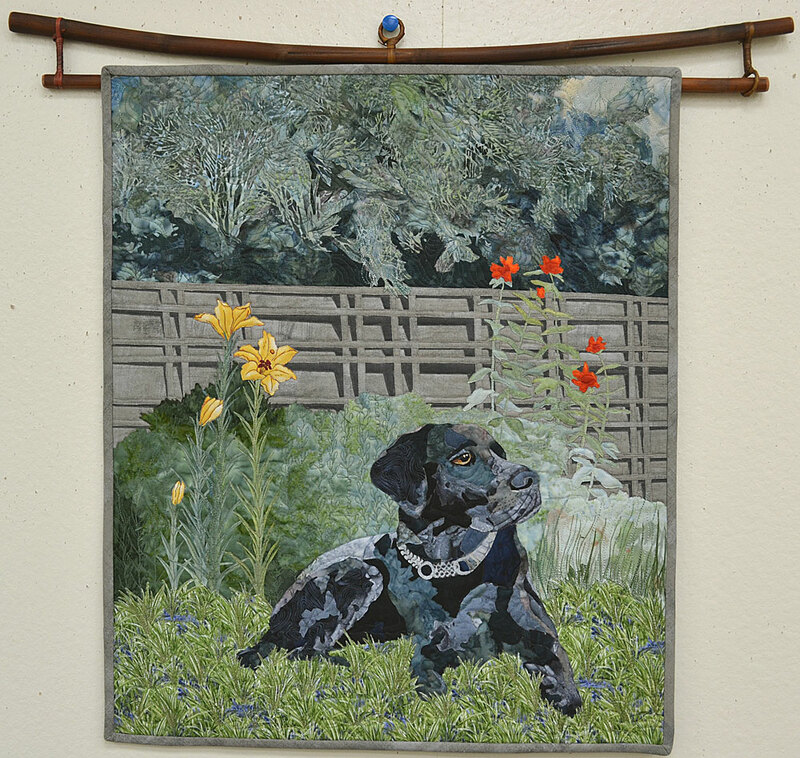 She sewed the opening shut, and quilted the frame. Leslie quilted around the horse and ribbons. The panel comes with an extra bow and holly, which Barb also backed, quilted, and tacked on for a 3-D effect. It was pretty fast and looks great. If you feel like horsing around too, you can find this panel on our website by clicking on the picture.